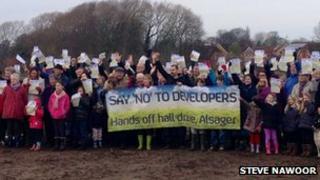 About 300 people have protested against plans to build 150 houses in south Cheshire. Proposals to develop two green-field sites near to Hall Drive in Alsager have been submitted to South East Cheshire Council by Emery Planning. Emma Nawoor, from the Hall Drive Residents Action Group, said: "We're not saying don't build homes, just concentrate on the brown-field sites." Emery Planning said the development of green-field sites was necessary. The protesters gathered for two hours from 11:00 GMT on the fields of Hall Drive. Mrs Nawoor said residents in the area were also concerned about an increase in traffic. She said: "There is one main road into Hall Drive that can become incredibly busy so we're worried about the number of cars doubling and the knock-on impact at junctions." In a statement, the developers said: "The development of green-field sites is needed and having new residents would enhance the town centre. "Whilst it is regrettable there is some concern about the proposals, we are confident it would allow for the growth required to meet housing needs in a sustainable location."